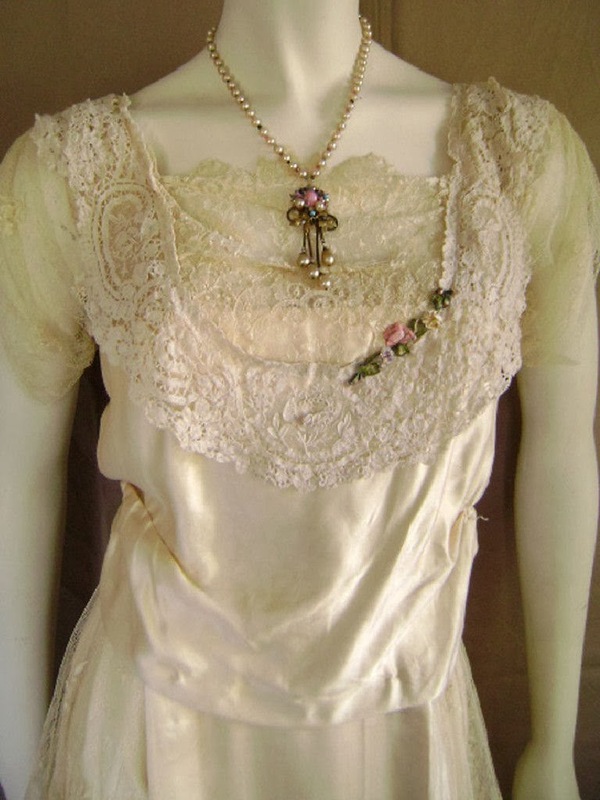 QUEEN OF THE FAIRIES ENCHANTS you with this VERY STRONG AND STURDY Edwardian era wedding or dinner dress. 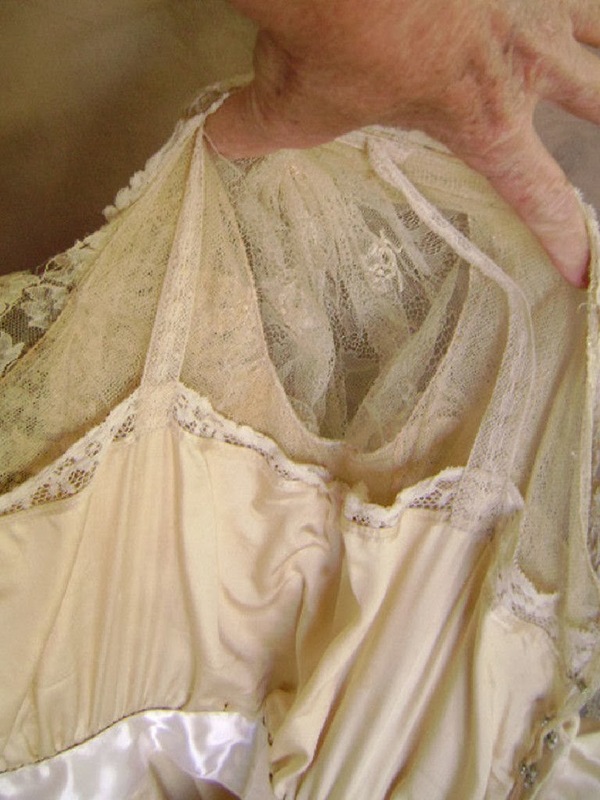 Usually silk this old is very fragile, but this fabric is very strong showing no weakness. 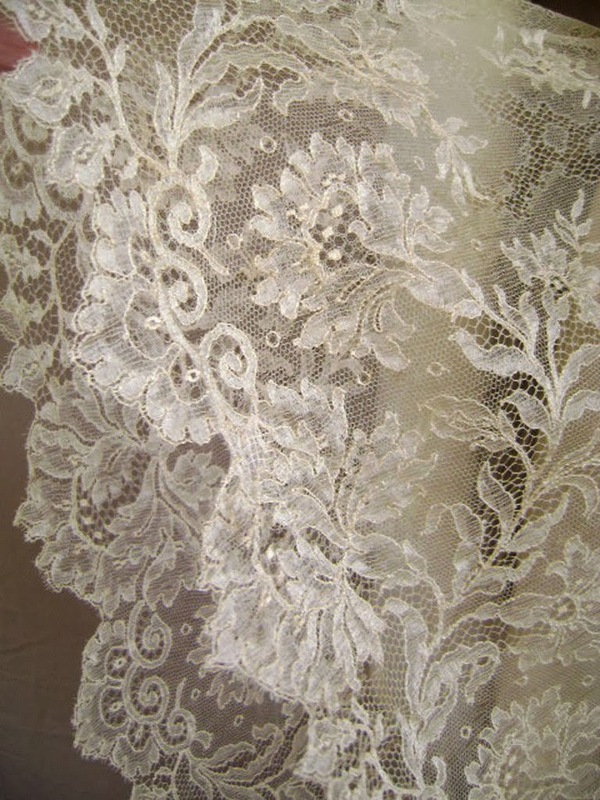 It is not dry and brittle, it is beautiful silk satin, a nice weight to it. The dress has layers as you can see. 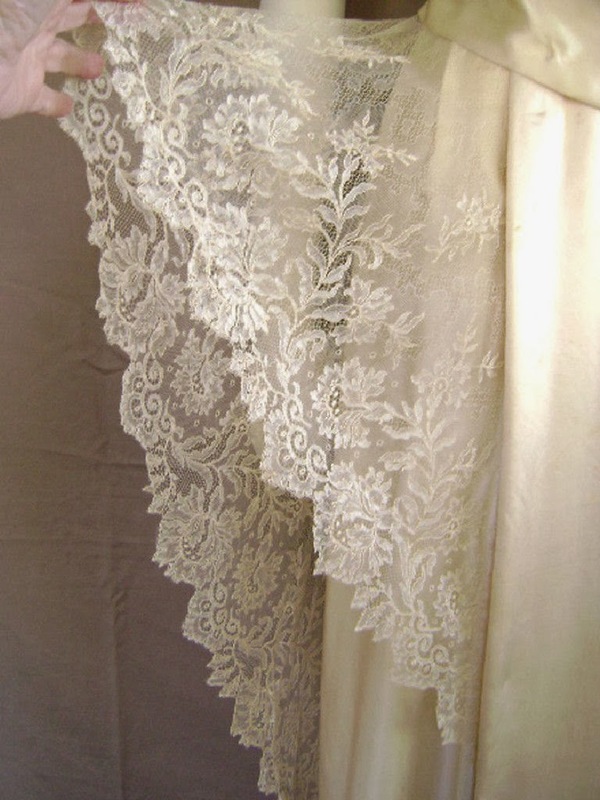 Starting with the bodice there is a silk satin camisole, lace trimmed which is then covered with a full bodice of netting which has the chantilly lace of the bodice attached to it. 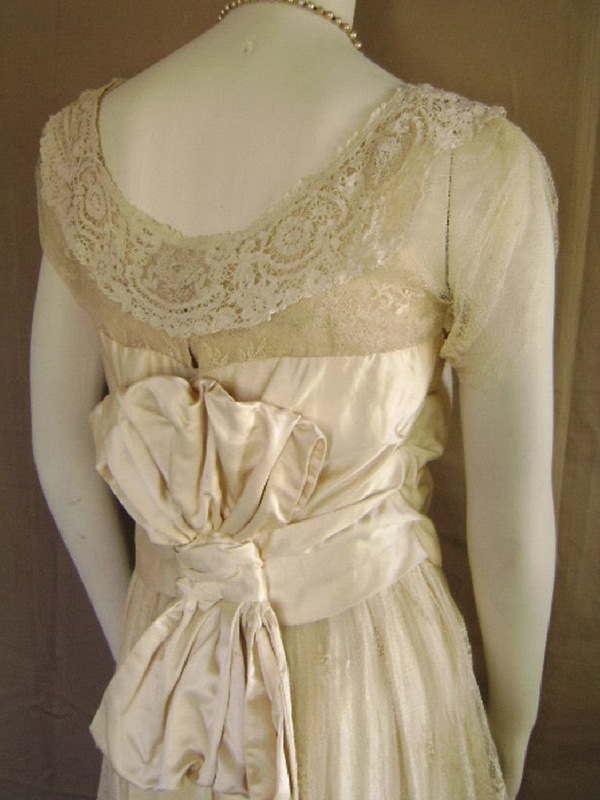 Then the silk satin cummerbund, and the exquisite tape lace collar which has fancy net insets (see closeup photos). 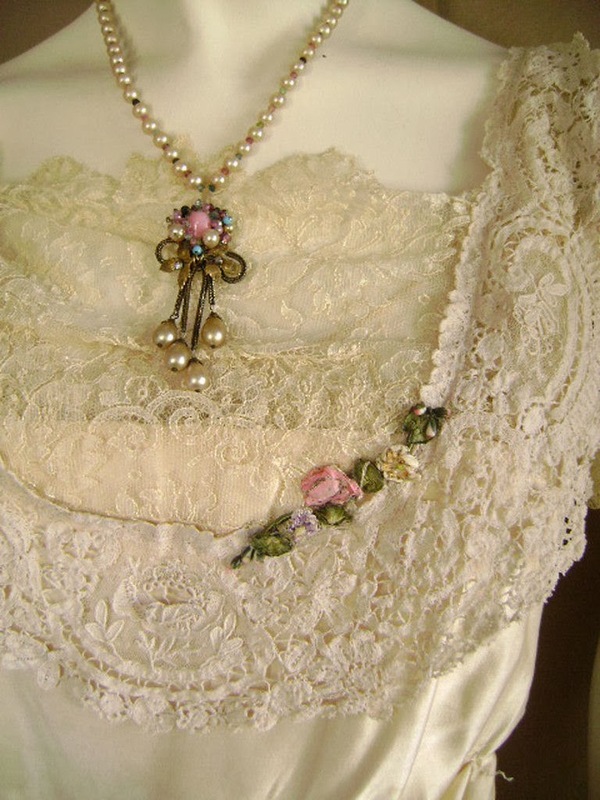 Wonderful silk flowers and leaves garland across one side of the tape lace collar. 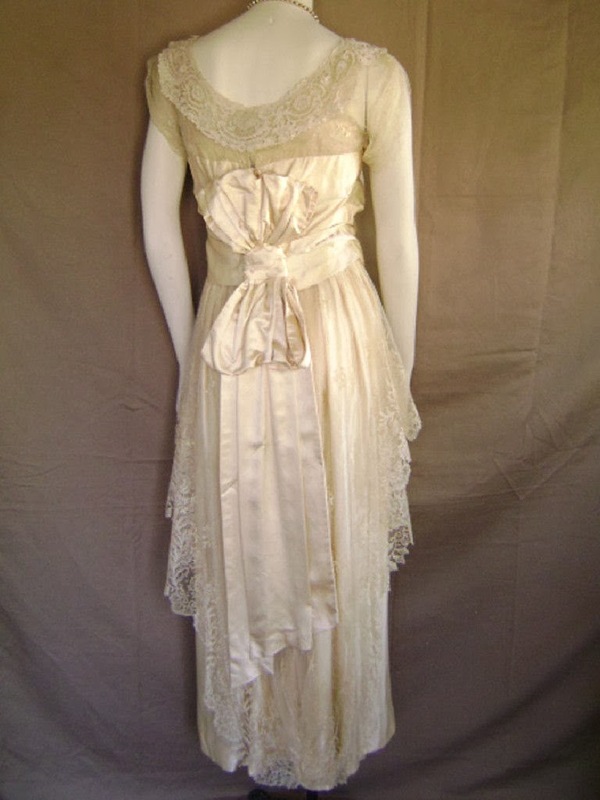 The dress is built upon a grosgrain petersham which is covered or faced in the satin silk. See inside photos. 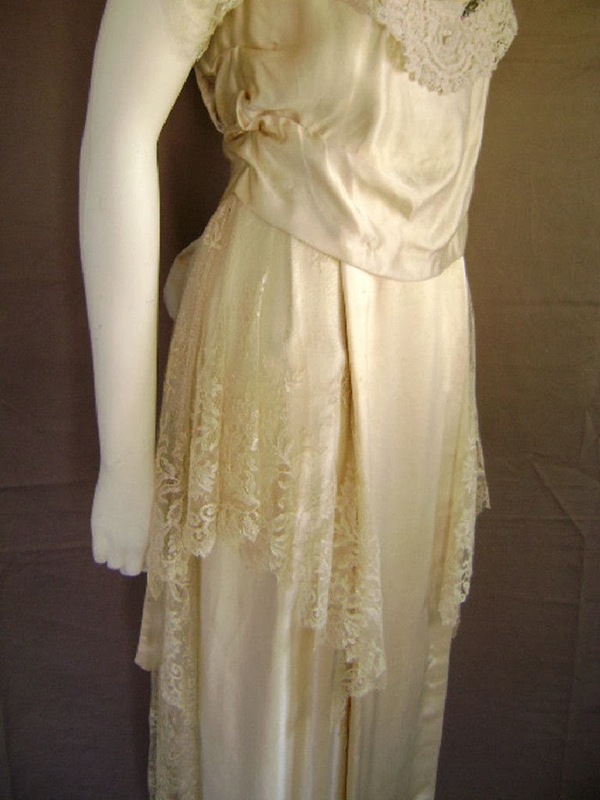 The skirt is of the matching silk with chantilly lace side pieces. A "train" hangs down the center front and a matching bow and tails hangs down the backside of the dress. There are many layers of snaps and hooks/eyes, all strong and well attached. 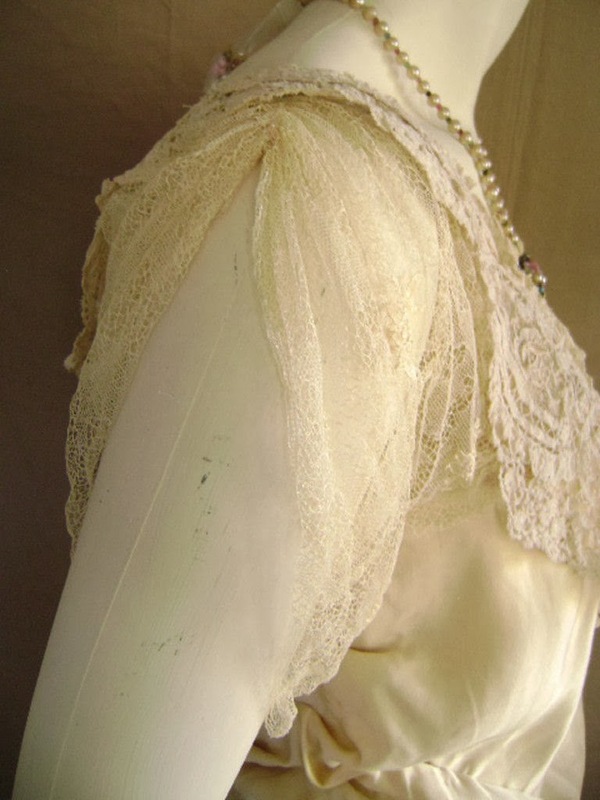 Look to the inside photos, there is no underarm damage, the gossamer sleeves are intact and sturdy. Overall near perfect. All to fault is a bit of the tiniest bit of speckles, tiny and just one shade darker than the silk (again see photos), never to bother anyone when worn, the dress will bowl people over. These are upon the front train, see photos. The dress is otherwise amazing, no underarm discoloration, no odors. No tears, no need of repairs. The dress is sturdy and wearable. The dress is a bit larger than your usual 22/24 inch waist, see measurements below. You may find upon close inspection one or two minor pin holes/fabric flaws like all old fabric develops, but no large holes or tears to distract, this is in excellent condition, see all the many large photos below... Look to my store to see my other unique items. Probably about 1916 or so. The little floral ribbon detail will be a big hit in the next decade. :-) Also, I think I need to make this dress.